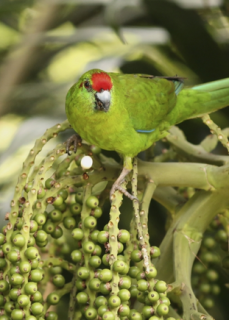 The Tasman Parakeet feeds in trees, and also on the ground. They sweep leaf litter aside with their feet, looking for seeds. Adults bright green with light yellow wash underparts. Forehead, crown, lores and patch behind eye red. Upper wing coverts green. Primary coverts and outer webs of primaries violet-blue. Under wing coverts yellow-green. Red patch on either side of rump. Tail above dark green with yellow edges, under tail dusky grey. Bill blue-grey. Eye red. Female slightly smaller, less red behind eye, smaller bill. Eye brown. Tail shorter than in adults. Red markings on head less apparent. Loud kakakakaka, kek-kek-kek, or kek-kik-kek. A Guide to Parrots of the World, Juniper and Parr, 1998. Over 600 chicks were banded during 1985-2007, most of which were bred and fledged from the national park's assisted wild breeding programme. Not seen in other aviculture. Small seed mix such as: canary, millet and smaller amounts of oats, buckwheat, safflower and a little hemp; limited sunflower seed; spray millet; green leaves such as: Swiss chard, lettuce, sowthistle, dandelion, chickweed; seeding grasses; rearing food made from hard-boiled egg, wholegrain bread, and carrot, all ground to crumbly consistency; complete pellet. Love to climb, therefore provide ladders, ropes and swings; not a vigorous chewer. Provide large flight for exercise. Provide areas for bathing. Loves to scratch around on ground. Clearance of forests before 1950, for timber, agriculture and pasture and the degradation of foliage has severely reduced suitable habitat and nest-sites. Nest-site availability has been further reduced by competition with introduced Crimson Rosella Platycercus elegans, Common Starling Sturnus vulgaris and feral honey bees. Introduced black rats Rattus rattus. have caused nest failures. Disease has also been found in the population. Confined to the Norfolk Island National Park and adjacent forested areas and orchards. Their diet includes seeds, fruits, flowers, pollen, sori, sprout rhizomes and bark of 30 native and introduced plant species. Birds reach sexual maturity at a relatively early age. They forage 7m (20ft) up in the trees through autumn, then in the winter move closer to or on the ground. October-December, sometimes more than once a year.